The universe is presented to us as something beautiful, complex while at the same time exotic. It not only contains objects that defy our imagination, such as black holes, but both time and space can be warped and we now know that the cosmos itself had a beginning: the Big Bang nearly 14 billion years ago. Although captivating, these are not easy concepts to understand for some primates, us, who evolved on the African savanna. Our mindset, developed at that time, is based on three-dimensional space and time which is linear and homogeneous in course, regardless of where we are. How did we come to know this fact that is so strange and foreign to our direct experience? The answer lies in one of the great heroes of the twentieth century, Albert Einstein but, as we shall see, not only in him. In November 1915 Einstein published several scientific articles that would largely change astrophysics and with it, our perception of the universe. This process occurred through a theory in which mathematical ingredients had an extraordinary importance and physical components, direct references to reality, were apparently scarce. In fact, except for a few studies, it would be several decades before its true importance was recognized. This is his theory of general relativity, which deals with the gravitational pull. Let’s remember that ten years earlier, in his annus mirabilis of 1905, Einstein had published three articles of great influence (awarded the Nobel Prize in 1921 for the so-called photoelectric effect, which is critical to the functioning of solar panels, for example) and in one of which he formulated his theory of special relativity. Although both include the word relativity, the 1905 theory was on movement and proved that there was no time or absolute space, something that again “attacked” our perception as primates. Even so, their validity has been proven time and again experimentally. But, what is the theory of general relativity? In the late nineteenth century it was known that the planet Mercury, the closest to the Sun, had a peculiarity. Its orbit did not respond perfectly to Johannes Kepler’s laws of planetary motion, that were derived from Isaac Newton’s Law of Universal Gravitation. Mercury, like the other planets in the Solar System, moves around the Sun tracing a path somewhat distinct from a circle. It is a smooth ellipse, a type of curve already described in antiquity. However, systematic and precise observations showed that Mercury had deviated from its path systematically. Although this change, called precession, was only 43 seconds of arc each century, which roughly corresponds to the angular size of a one euro coin seen a few hundred meters away, it was significant enough to create some discomfort. It is true that the planet Neptune was discovered in 1846 due to the gravitational effect caused in Uranus’s path, in a pan-European community effort, not without nationalist competitions. But in this case, disturbances and their mathematical description would be fully understood and would respond perfectly to Newton’s theory of gravity However, Mercury was more elusive. Using a more volatile poetic license, as its name suggests. Albert Einstein knew about the problem of the anomalous precision of Mercury when he made a summary of his special relativity in 1907, in which he realized that it could violate a fundamental principle in physics: that bodies fall at the same speed, regardless of their mass and shape. Assuming, though, that there is no friction because of the air around us. Formulated by Galileo Galilei in the early seventeenth century, it was one of the primary foundations of mechanics. So, did special relativity take us back to Aristotelian physics? Einstein’s genius was shown at that time with what he called his most brilliant idea: the principle of equivalence, whereby the inertia force is equal in all respects to the pull of gravity. Forces that are familiar to everyone, since gravity binds us to our planet and inertia appears, for example, when the vehicle which we are in starts and we experience a pull in the opposite direction to the movement. Einstein illustrated his equivalence principle with a thought experiment: in an elevator without windows both forces are indistinguishable. Figure: Illustration of the British newspaper London News explaining the deviation of light rays due to the gravity of the Sun, according to measurements made in 1919 and dramatically confirming Albert Einstein’s theory of general relativity, published four years before. In developing his theory of general relativity, Einstein would not be alone, as important scientists participated in different ways. Some did as epistolary correspondents commenting with their progress, and the obstacles they faced, and whose letters allow further development of the theory; others, as necessary collaborators. Names are therefore included like Marcel Grossmann, Michele Besso and Erwin Freundlich. The latter, for example, a young astronomer at the observatory in Potsdam, was essential to develop the ideas that would lead to the first experimental demonstration of the theory. The collaboration took place in the winter between 1911 and 1912. In 1913, Einstein developed a preliminary theory, which he called “Entwurf” (draft in German) which, although erroneous, was very important in his way toward the mathematical formulation he would publish two years later. In fact, just before, along with Grossmann, he had already found the right solution, but without recognizing it as such. An example of the importance of chances and fortune in the advancement of science. After the appearance of the theory of general relativity in 1915, the search for its empirical demonstration began. It could only be done with the greatest body mass available: the Sun. 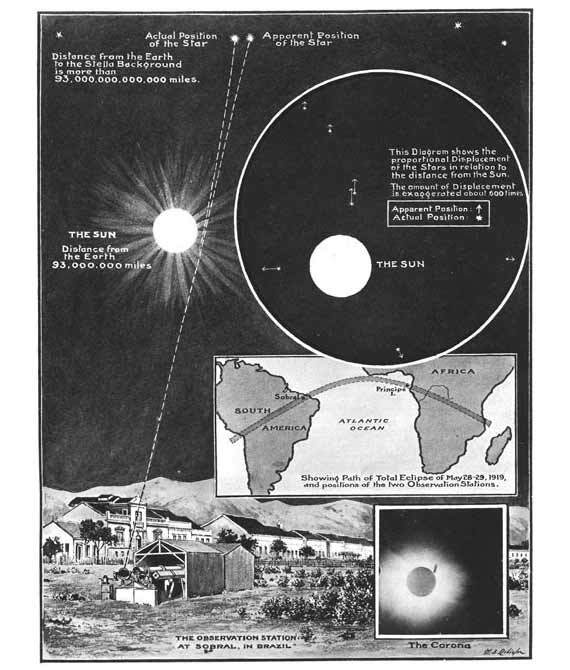 In 1919, an international team coordinated by Arthur Eddington observed during a total solar eclipse how gravity of our star deflected light rays coming from distant stars that passed near the surface, just as Einstein’s new theory predicted compared to Newton’s theory, which predicted a different deviation. The results made headlines in many newspapers around the world and Einstein became a well-known media figure. The experiment would be verified during another solar eclipse in 1922. However, the theory of general relativity would not emerge, becoming essential, until later. After World War II, a new generation of scientists driven by investments in science and technology that were promoted at the time (and which, incidentally, we continue to benefit from) realized the true potential of the theory and integrated progress, from both an observational as well as theoretical standpoint. The idea of an Expanding Universe thus emerged, according to the so-called Hubble’s Law (although initial notions are older and Edwin Hubble did not give due credit to Vesto Slipher’s measures, published in 1917, and the work of Georges Lemaître, 1927), with a beginning, the Big Bang, whose observational evidence was found by chance (one more example of serendipity in science) by Arno Penzias and Robert Wilson in 1964, upon finding the Cosmic Microwave Background, a uniform emission because of the Big Bang. And don’t forget the discovery of black holes and other celestial objects like Quasars and Pulsars (Neutron stars, the end of objects that are more massive than the Sun), whose description requires Einstein’s theory and the solutions found by Karl Schwarzschild two years after its publication in 1915. 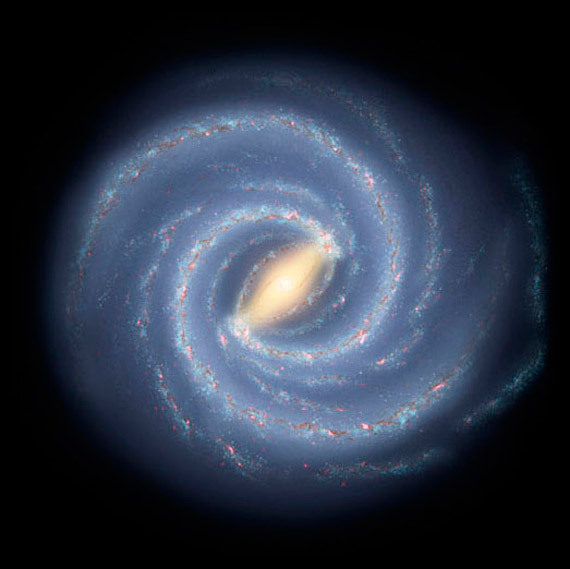 Our own galaxy, the Milky Way, contains a huge black hole in its center, which dominates the movement not only of its surroundings, but the influence of which extends far beyond. But to be more prosaic, a theory formulated a century ago, that of Einstein’s general relativity, is essential to use everyday tools such as GPS navigation, because the internal clocks of each of the satellites are affected by the Earth’s gravitational field, which slows time. So seemingly insignificant but enough so that, if ignored, the positions would be wrong. Therefore, we can say that our well-being depends to some extent on a theory that was devised in response to a minor problem of celestial mechanics. The behavior of the planet closest to the Sun is not so “mercurial” after all.